The Whiskey Brothers at "Bards and Bluegrass," courtesy of Gillie Collins. The Whiskey Brothers at “Bards and Bluegrass,” courtesy of Gillie Collins. 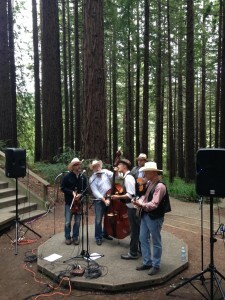 An hour’s drive and a world away from Stanford’s campus, UC-Berkeley’s Botanical Garden is home to the weekly Redwood Grove Summer Concerts. 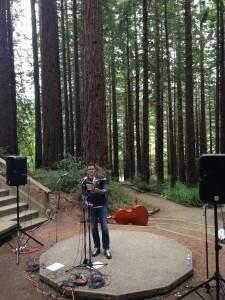 Last Wednesday, local poets and musicians gathered at the garden’s amphitheater for the festival’s “Bards and Bluegrass” performance. I arrived at the concert a couple minutes late. The trail into the woods was soft with leaves and needles. 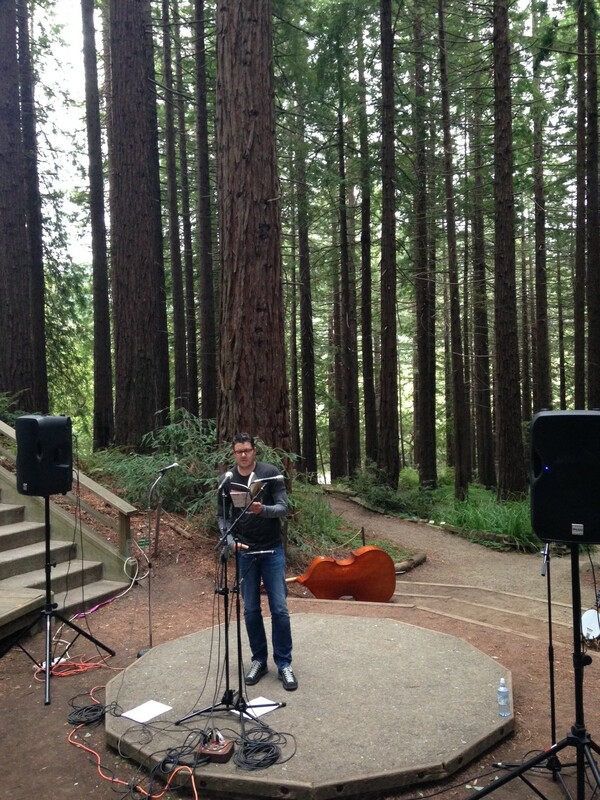 I imagined, for an instant, getting lost in the deep, cool shadow of the redwoods — but then, at a fork in the road, a mandolin sounded. I followed. is the delight these men take in their own voices. Their grins and dimples and happily superfluous jokes are contagious. The group’s aesthetic is — go figure — alcohol-centric, so Jeff introduced the evening’s “Bards and Bluegrass” program in appropriate terms: “It’s like bourbon and pickle brine,” he said. “Each one makes you want more of the other.” This analogy proved pitch-perfect. The Whiskey Brothers gave up the stage to a splendid-if-unlikely complement, a group of Bay Area-based poets. 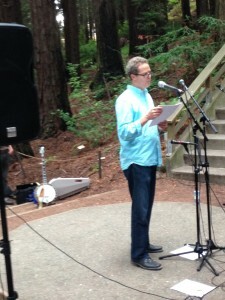 Keith Ekiss at “Bards and Bluegrass,” courtesy of Keith Ekiss. Tess Taylor’s reading felt like a natural elaboration of Ekiss’ “true stories.” Her poems knit together the past and present, personal and public. Her latest book, “The Forage House,” uncovers the silences in a family’s history, which begins in antebellum Virginia and ends in The Golden State. In “Oral History 1963,” for instance, Taylor recalls a civil rights march in Danville, North Carolina, and her grandfather’s efforts to protect protesters from harsh sentences. In the end, Taylor confesses he “backpedaled,” perhaps for the sake of his “wife & children.” Here, Taylor evokes a broader American story, one of false starts and hypocrisy, only partly redeemed by historical acknowledgement. My grandmother came west and stood here. The Blue Ridge haunted her dreams. 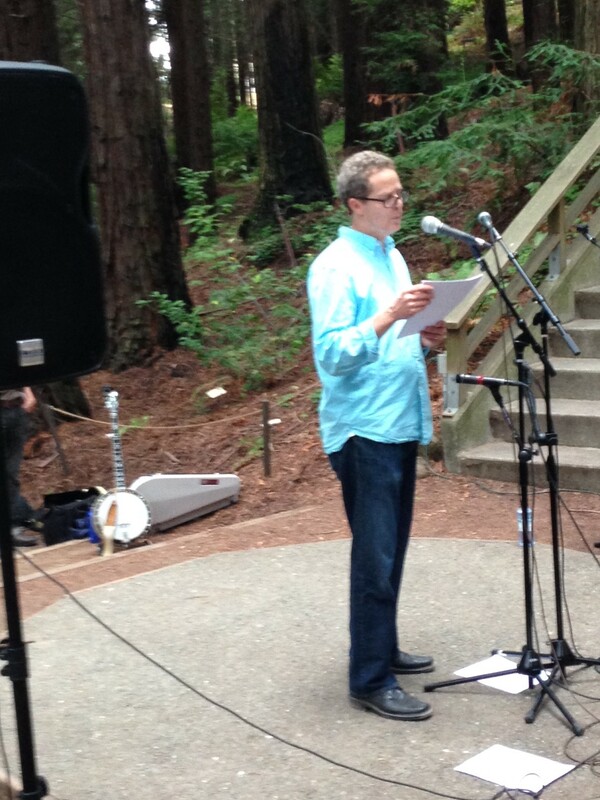 Dean Rader closed the performance, reading from his first poetry collection, “Work & Days,” which won the 2010 T.S. Eliot Prize, and his recent collection of poems, “Landscape Portrait Form.” A scholar of American Indian culture and professor at University of San Francisco, Rader writes poetry that is formally innovative but never unnecessarily so. One of his pieces, “Genealogy of Unfinished Love Poems,” is composed of four sections — elegy, comedy, haiku and epistolary. The poem is syncopated by blanks, like “I don’t know /what the dead / __ about love” and “Your eyes are so __.” In what is said (and unsaid), Rader explores the limitations of language, the ways in which romance is and isn’t laughably predictable. There are times when I believe that the “we” is a fiction, that there is no common thread knitting us together. But when the poetry and music stopped at 8 p.m. on Wednesday, I looked around me. Grandmothers rounded up toddlers and fathers packed up picnic dinners. Slowly but surely, people gathered their belongings and disbanded, making their way to their cars. The quiet they left behind was not silent. A bird trilled on its branch, a frog gurgled nearby. The Whiskey Brothers packed up their instruments, and I dawdled behind the crowd. The redwoods, of course, stayed still: For hundreds of years, they have practiced this art of listening. Listen to your impulse to get outside Stanford’s Campus. 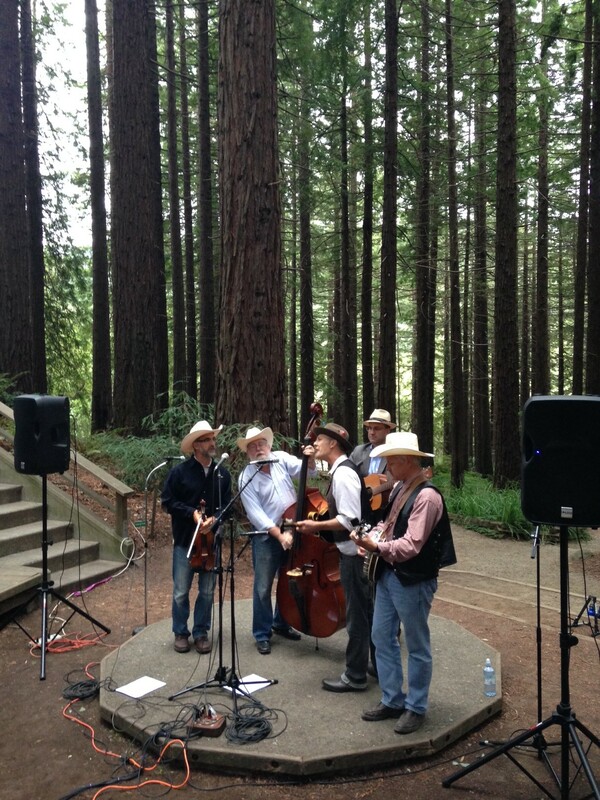 Check out Redwood Grove Summer Concerts on Thursdays from 5:30 – 7:30 p.m.